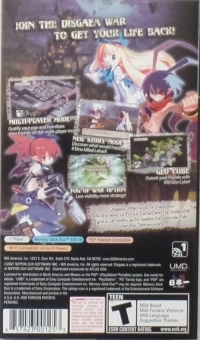 Box Text: JOIN THE DISGAEA WAR TO GET YOUR LIFE BACK! 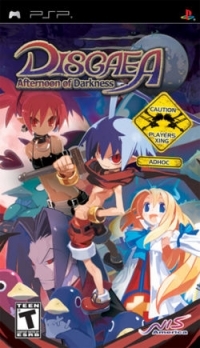 Disgaea: Afternoon of Darkness tells the story of Prince Laharl and his outlandish group of misfits as he battles for ultimate rule over the Netherworld. MULTI-PLAYER MODE_ Gratify your ego and humiliate your friends on the multi-player mode! NEW STORY MODE_ Discover what would happen if Etna killed Laharl! GEO CUBE_ Outwit your friends with the Geo Cube! FOG OF WAR OPTION_ Less visibility, more strategy! 06-27-2017 silverbow Box Text JOIN THE DISGAEA WAR TO GET YOUR LIFE BACK! Disgaea: Afternoon of Darkness tells the story of Prince Laharl and his outlandish group of misfits as he battles for ultimate rule over the Netherworld. MULTI-PLAYER MODE_ Gratify your ego and humiliate your friends on the multi-player mode! NEW STORY MODE_ Discover what would happen if Etna killed Laharl! GEO CUBE_ Outwit your friends with the Geo Cube! FOG OF WAR OPTION_ Less visibility, more strategy! This is a list of VGCollect users who have Disgaea: Afternoon of Darkness in their Collection. This is a list of VGCollect users who have Disgaea: Afternoon of Darkness in their Sell List. This is a list of VGCollect users who have Disgaea: Afternoon of Darkness in their Wish List.